(Photo: WCC/Sean Hawkey)Marching for climate justice in Bonn, Germany on Nov. 12, 2017. "Climate justice cannot wait. The most vulnerable must be in the midst of the world focus to overcome the climate challenge," said WCC general secretary Rev. Olav Fykse Tveit preaching on Nov. 12. "We have already taken many steps together," said Tveit. "We strongly believe in efforts to stop climate change. "And what is more, we believe strongly in the work for climate justice, and in shared responsibility in addressing these issues. Now is the time to take action." With just one more week of negotiations remaining it is of paramount importance that COP23 and its Fijian presidency prioritize the needs of the most vulnerable countries for whom climate change is a harsh reality already today church leaders campaigning for climate change have warned. The service was held in St Paulus Church with Canon Michael Bullock presiding. Tveit and Bishop Emeritus Bärbel von Wartenberg-Potter were accompanied at the altar by Bishop Jan Jansen from the Evangelical Lutheran Church in Oldenburg, Rev. James Baghwan from the Methodist Church in Fiji, and Rev. Tafue Lusama, general secretary of the Congregational Christian Church of Tuvalu. Tveit praised the journey shared by religious leaders as they attend the 23rd Conference of Parties, known as COP23 of the United Nations Framework Convention on Climate Change underway in Bonn, Germany, from Nov. 6-17. The WCC, LWF and Act Alliance together represent more than half a billion Christians worldwide. As many across the world observed the 500th anniversary of the Reformation this year, Tveit said that the wisdom of God is working in this world creating something new every day. "Now we are reminded that this reformation must go on", Tveit noted. "That is a promise also for us: the darkness of our foolishness is not going to overcome God's light. 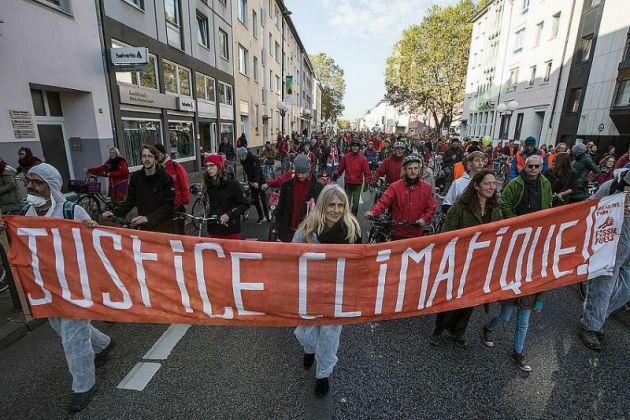 Behind everything that happens here in Bonn these days, behind all the work we do as politicians, as civil society, as people of faith to address climate change - it is about being foolish or being wise." He said, "We seek wisdom today, wisdom to take care of this one planet, the creation of God that is granted to us, to our children, to our grandchildren, as it was to our parents and our forefathers and foremothers, and to all that lives on this planet: animals, plants, everything." Ecumenical leaders said they were seeing little progress over a week toward securing the key demands of some of the world's most vulnerable peoples and communities. So far, no significant steps have been made in financing and strengthening the loss and damage mechanism or clarifying the provision of climate finances. "We do not want COP23 to be a lost opportunity," said Rudelmar Bueno de Faria, ACT Alliance general secretary. "The hopes and aspirations of millions of people who are facing the harshest impacts of climate change depend on urgent actions to mitigate climate change and its impacts." Bueno de Faria noted, "While this is a 'technical' COP, negotiators must not forget what climate negotiations are really about – people and communities all across the world, whose lives are in serious jeopardy as a result of climate change." LWF general secretary Rev. Martin Junge said that climate Justice is also a matter of intergenerational justice and about churches acting now. "I have been encouraged to hear about churches' climate action and advocacy, which the young LWF delegates at COP 23 have shared: energy transition, responsible consumption, theological education and local advocacy on climate justice is already on the agenda of several churches. This is good news." Referring to the urgency to address climate change, Junge said, "Climate change is not fake news. It is bad news for the human family, particularly for the most vulnerable. The Paris agreement needs to be implemented. Now!"